If you were injured or lost a loved one in a stair accident in Miami, you and your family should not waste any time in contacting a Miami stair accident lawyer. 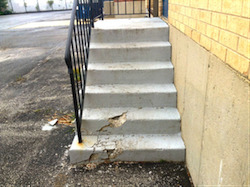 More than 1 million people are killed or injured in stair accidents each year according to the national Safety Council. People or companies who control or own stairs have a duty under the law to keep those stairs and their property safe and free from hazards. This duty includes escalators, elevators, stairwells, and staircases. But it is extremely important that you consult and hire the best Miami stair accident and injury lawyer you can find. At the Wolfson Law Firm, our premises liability lawyers in Miami have been helping the people of South Florida with their personal injury claims since 1963. Our Miami stair accident attorneys also know how to help you and your family. We offer free, no-obligation consultations at our office, your home or workplace, or wherever it is convenient for you. You should also know that you will never owe us a fee unless we make a recovery for you. All you need to do to get us working on your stair accident case is to call us at (305) 285-1115. Don’t be a silent victim and don’t delay – get the justice that you deserve. Stair accidents have the potential to produce some of the most severe and life-threatening injuries. Aside from the obvious hazards of sharp edges, declines and the effects of gravity the truth is most people have little to no experience in falling down stairs. As compared with a slip and fall on a flat floor, the stairwell accident compounds the potential danger. 1. Get the medical help that you need. Call 911 or ask someone to do it for you. You should always do whatever you can to prevent any additional injury. 2. Get the evidence that is available to you. Use your cell phone or ask anyone to get photographs and/or video of the scene; of where you fell; of what caused you to fall. Do not assume that someone else will get the photos you will need to prove your case. On more than one occasion, our Miami stair accident lawyers have seen cases where defendants have fixed the problem and destroyed evidence. Don’t let that happen to you. 3. Ask for a property manager or security or anyone associated with the building so that you can make a report. If you can, do this then ask for a copy although they are not legally required to give it to you. But it can never hurt to ask and the fact that you made a report, asked for a copy and were refused could make for interesting testimony before a jury. 4. Once you have received your initial medical treatment, then follow up with either your own doctor or a specialist who can perform a full examination. All too often our Miami accident lawyers will meet with people who did not learn the true extent of their injuries until they had a complete examination and underwent diagnostic testing. Don’t let that happen to you. 5. Get in touch with the best Miami personal injury lawyer that you can find. Make sure that you are comfortable with your choice and that you can trust your lawyer. Beyond your gut instincts, you should also do your homework. Investigate any potential lawyer that you are considering. Look them up on Google. Review their qualifications and recent results. It is well within your power to make sure that you are hiring the best Miami accident lawyer to represent you and your loved ones. Our Miami accident lawyers have served the people of South Florida for more than 60 years. They are proud of their service to the wonderful and diverse communities of South Florida including Hialeah, Weston, Miami Lakes, Pembroke Pines, Aventura, South Miami, Kendall, West Palm Beach, Allapattah, Fort Lauderdale, Miami Gardens, Miami Beach, Miramar, North Miami, Boca Raton and North Miami Beach. To speak with a Miami stair accident lawyer today just call (305) 285-1115.